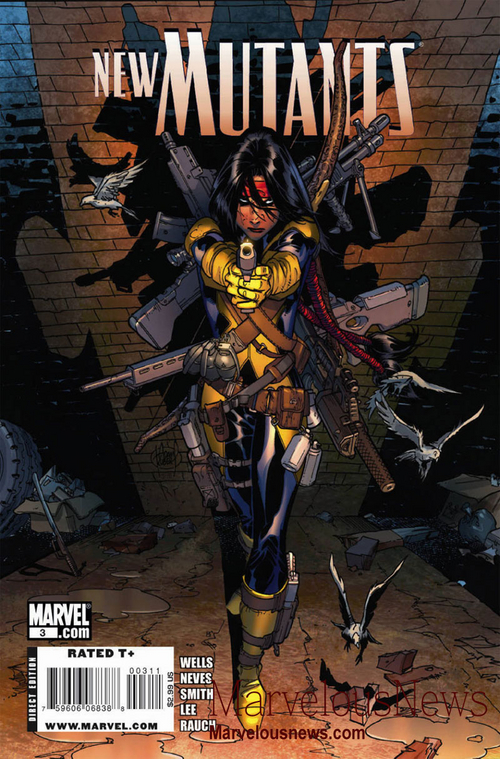 Moonstar (aka Mirage aka Psyche) was born as Danielle “Dani” Moonstar a member of the Cheyenne Native American Tribe in Boulder, CO. She first appeared in Marvel Graphic Novel #4: The New Mutants in 1982, and has been a part of various Marvel groups over the years, mainly the X-men, but she also had a brief stint with S.H.I.E.L.D, and at one point she resided in Asgardia after being selected as a valkyrie. Just last week she appeared in The Fearless Defenders #2 by Cullen Bunn and Will Sliney, and will likely become a permanent member of a new all-female team alongside Asgardian princess Valkyrie and the bionic kung-fu powerhouse Misty Knight. Moonstar’s mutant powers began to manifest when she was around 10 years old, as an empathic ability to communicate with animals and to project manifestations of people’s fears and desires. When these powers first appeared, she could not control them. She began having nightmares and visions of a demonic bear, and shortly after this her parents mysteriously disappeared. She was taken in by her grandfather Black Eagle who connected her with Charles Xavier, and she soon becomes the co-leader of a group of students at Xavier’s school, called the New Mutants, which originally included Cannonball, Karma, Wolfsbane, and Sunspot. Moonstar’s parents are eventually returned to her once she and her teammates face off with the demonic bear of her childhood visions. In a particularly awesome chapter of her life, Moonstar is kidnapped by Enchantress along with the other New Mutants members, which now includes new member Magik, and taken to Asgardia. Magik attempts to use a teleportation disc to rescue the group, but ends up teleporting them all to random places on Asgardia. Moonstar ends up in a valley, where she rescues a winged horse that was trapped in mud and barbed wire. Moonstar bonds with the horse who just so happens to be Brightwind, one of the “Choosers of the slain”, who proceeds to select Moonstar to become a Valkyrie. On Asgardia, Moonstar fights alongside other valkyries and her powers are amped by her valkyrie powers, giving her the ability to see an aura of death around those in mortal danger, to physically fight Death itself, and to make her mental projections into solid physical beings. She’s so insanely superpowered that she beats up on Gods, like Ares and Hela, goddess ruler of Hel. 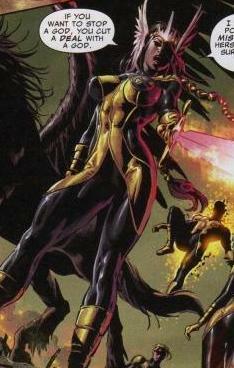 However, her horse Brightwind is later killed in battle, and she returns to Earth shortly after, where she has a brief stint at S.H.I.E.L.D., before losing her powers in the House of M crossover. At one point she makes a deal with Hela and temporarily gets back her powers, but by the time she appears of Fearless Defenders #2, she remains depowered yet still hard to take- down. 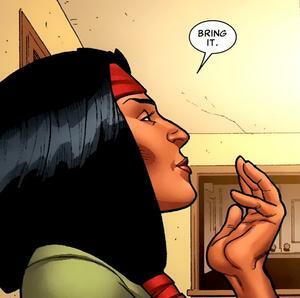 Moonstar is one of few Native American characters in comics, and is very proud of her Cheyenne heritage, bonding with other indigenous characters and wearing visible symbols of her culture. Villains seem to always get a kick out of calling her “Pocahontas” after which she promptly kicks their asses. 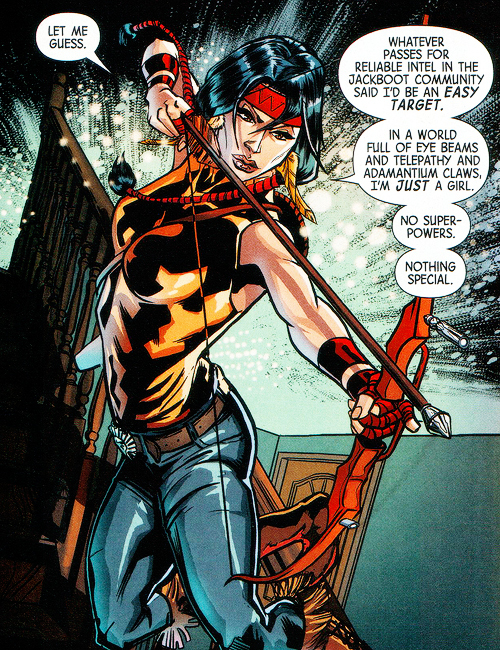 She may not be officially part of the Fearless Defenders team yet (she hasn’t even met up with Misty and Valkyrie), but she’s a formidable addition. Good call Marvel. Also, incredibly brief review of Fearless Defenders #2 — waaaay better than the first issue, like by a lot. I was seriously concerned after issue #1, but this issue is definitely making me keep it on my list. I don’t doubt that this is in no small part due to Moonstar, who is just an incredibly dynamic character. I’m also loving that this team-up looks like it’s gonna have two non-powered women on the team. Ballsy.